EXCELLENT! The ABC deserved to win – it far and away had the best coverage. good to see people wanting serious analysis, rather than silly nonsense. Again if I had it I would give it. As they aren’t prime time I haven’t been able to source on a weekend sorry. David, DOND vs Antiques please? Weekend ratings are always harder to source, and often not available until Monday. I expect Seven would have won Friday. Where are the ratings? It’s going to be a cliff hanger of a week for Nine and Seven. There’s only a fraction of a percentage point seperating the two. Cricket helped Nine kick off. They even won the night in Sydney. Viewers are also wise to Border’s clip specials. Better Monday for Nine. Only 6% behind 7 when 9 can be 10% or more behind. Millionaire did better and looks like it is the best for the year. City Homicide did much better for it’s finale. What women Want did well as well getting over 1 million viewers. NNN is getting stronger and getting close to 7 and ACA bet TT. Neighbours also managed to be in the top 15. I think that Nine will either win the week or lose to seven by less than 2 %. Nine are getting better each week. They will probably do well WED and THU. 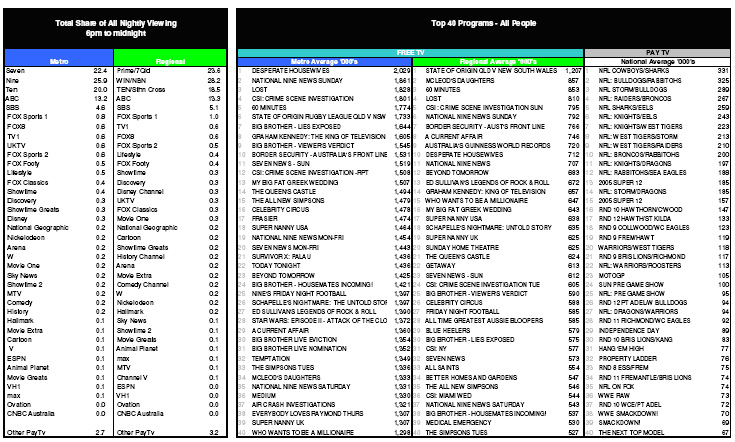 FRI might be better with AFHV and Sat may depend on viewers choices for the election. where are the rest of week 47 ratings? only sunday has been posted? That’s a big win, finally people have realized what a stupid show bingo night is. Now channel nine need a show at 7 for next year and to bring back the singing bee. There’s been too many times when channel nine have tossed out mediocre shows to try to get very high ratings only for them to get axed after two weeks. ps, rove come back next year!!! and bring on 2008. Hopefully 9’s ratings will sky rocket. OMG – thats a big win for Nine – the first of such a size for a long time. looks like the bad publicity for National Bingo Night has hurt the ratings.